How to Transfer Videos from PC to iPhone XS, XS Max, XR, X, 8, 7, 6s, etc. How to Transfer Videos from PC to iPhone XS, XS Max, XR, X, 8, 7, SE, 6s, 6, 5s, etc. Why Do We Need to Transfer Videos from PC to iPhone? For backup or freeing up iPhone space, we need to transfer videos from iPhone to PC. Well, what's the reason for transferring videos from PC to iPhone? The reason is simple. As a portable phone with super clear and large screen display, iPhone has become the preferred choice to watch videos on commute, in the plane, or on a long train journey. If you have downloaded a large pile of videos or movies from YouTube or other sites to your PC or have stored many digital movies ripped from DVDs, why not transfer them from PC computer to iPhone for enjoyment anytime anywhere using iTunes or third-party video transfer software. How to Transfer Videos from PC Computer to iPhone Effortlessly? - Transfer videos in MOV/MP4/M4V from PC to iPhone XS, XR, X, 8, etc. - Auto convert iPhone incompatible formats like WMV during transfer. - Auto rotate videos for perfectly playing on iPhone during transfer. Best iPhone video transfer software to send videos from PC/Mac to iPhone X, 8, 7, 6s, etc. Transfer Videos from PC to iPhone with iTunes? NOT Recommended. Why? 1. iTunes only syncs selected videos in the iTunes Library to iPhone, which means that iTunes will erase all the unselected items. 2. iTunes is unable to transfer videos with iPhone incompatible format or encoding from PC to iPhone, unless you convert the video in advance. 4. Windows PC users always confront various iTunes errors which are difficult to fix, such as "iTunes has stopped working". 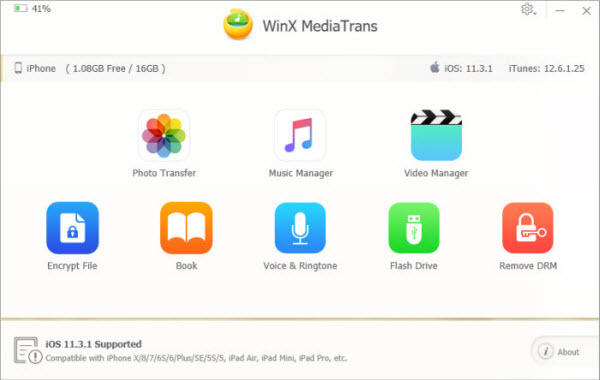 So, you're recommended to add videos from PC to iPhone by making use of an iTunes alternative like WinX MediaTrans. This is a professional file transfer program, capable of transferring regular and DRM-protected videos (VR movie video included), photos, music and other files from PC to iPhone, iPad and iPod, as well as transferring iPhone iPad iPod videos, music, photos and more to PC. Not only can WinX MediaTrans transfer MOV, MP4 and M4V videos from PC to iPhone, but also can transfer WMV, AVI, MKV, TS, AVCHD and other iPhone incompatible formats from PC to iPhone accepted formats thanks to the built-in video converter. Besides, it can rotate videos from vertical to horizontal automatically to make videos fit with iPhone perfectly. Differing from iTunes, WinX MediaTrans will never delete old iPhone videos when transferring video from computer to iPhone. And it is fully compatible with PC, be it running on new Windows 10 or previous edition like Windows 7. What's more, it is very easy to use and can complete transfer at super fast speed. To sum up, WinX MediaTrans surpassess iTunes in many aspects. How to Transfer Videos from PC to iPhone Without Data Loss? Step 1. Connect iPhone to PC. After launching WinX MediaTrans, it will prompt you to connect iPhone to computer via a USB cable. Feel free to use this tool, even if you're experiencing iPhone not connecting to WiFi issue. Besides, it will ask you to check "Prevent iPods, iPhones, iPads from syncing automatically" option in iTunes when you first use this tool. Afterwards, this software can detect your iPhone immediately and present your phone information at the software main interface. Step 2. Add videos from PC computer. Next to step 1, you should click "Video" button in main UI. After that, you will see all kinds of video categories listed in the left side, including Home Video, Video Recorded, TV Show, Music Video and Movies. Tap "Add Video" button in the top bar to select target videos/movies from PC. Note: you are not allowed to add videos to "Video Recorded" and "Movies" groups. Step 3. Begin transferring videos from PC to iPhone. When target videos are added, you just need to hit "Sync" button at the bottom right corner to start transferring PC videos to iPhone. Tip: If the added video is in an unsupported format, you can hit the "Convert" button to perform conversion before transferring or hit "Sync" to process conversion and transfer at one go. WinX MediaTrans is one of the best software to transfer videos movies from PC to iPhone. Not limited to Apple iPhone compatible formats, it can also transfer many iPhone unfriendly formats like MKV and AVI to iPhone playable formats. Meanwhile, you can transfer videos from iPhone to PC for backup and encrypt your iPhone videos with password while exporting to PC. Trial version allows you to free transfer 30 videos per day. Besides, it has a Mac edition. What's more, it is designed to transfer photos, music, eBooks and more between iPhone/iPad/iPod and PC/Mac. And, it can turn your iPhone as a flash drive to store any files as you like and function as an iPhone ringtone maker and an iTunes DRM removal tool. How to add videos to iPhone from PC/Mac without iTunes? WinX MediaTrans enables users to transfer videos from computer to iPhone at No.1 fast speed, also auto convert any video to MP4 and rotate video. Unable to transfer videos from Mavic Pro to iPhone? We have the solutions to help transfer 4K/1080P/720P drone videos from DJI Mavic Pro to your iPhone X, 8, 7, or other models. There's a list of best 5 photo transfer apps/software for Windows PC and Mac, to help transfer photos from iPhone iPad to computer and transfer photos on computer back to iOS devices hands down.